Arctic Albedo | Watts Up With That? Looking at the June 14 satellite photo above, you see the view which the Sun sees of the North Pole. Well not exactly, because the elevation of the Sun at its peak (mid-June) is actually fairly low in the sky. At the Pole, it is only 23.5º above the horizon. The video below shows what the earth would look like now, viewed from perpendicular to the plane of the ecliptic. Note that the region north of 66.5º is in perpetual light. 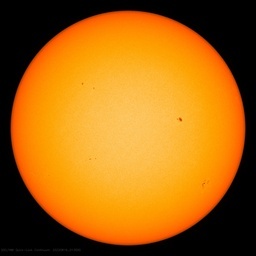 The image of the Sun is from the days when it used to have sunspots. Now, looking at the satellite photo again, we see three different shades of white. 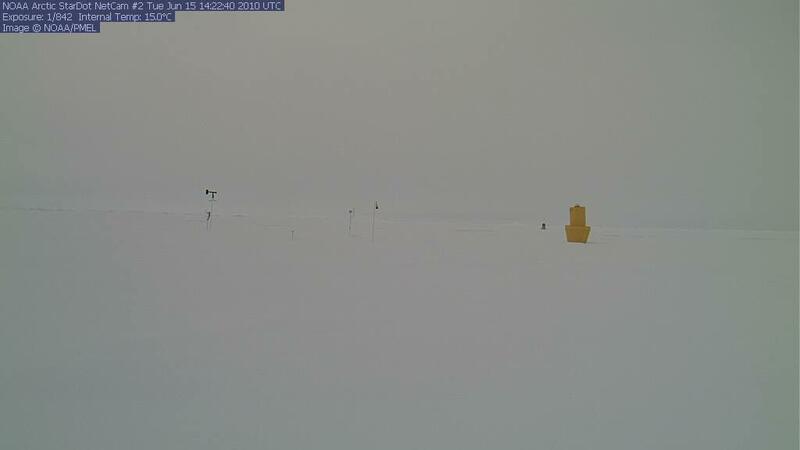 Snow is the brightest white (highest albedo) and can be seen in Greenland. Clouds are next brightest white, and at least partially cover almost the entire Arctic. In a few locations, you can see dirty white sea ice peeking out through the clouds. We often hear that sea ice controls Arctic albedo. There is some truth to this statement, but the real story is that the albedo of clouds actually controls the area of sea ice. When it is cloudy, little melting occurs. When it is sunny, the ice is more prone to melt. Consider this chart from the University of Alaska. They forecast the breakup of sea ice based on the total amount of sunshine received. When accumulated sunshine reaches 700 MJ/m², the ice breaks up. In a cloudy year (like 2009) this occurs later. In a sunny year (like 2007) it occurs earlier. 2010 is right in the middle. On a cloudy day, most of the sunshine reflects back into space from the top of the white clouds. That is why we see the bright white clouds in the satellite image. The real key to Arctic albedo, and melt – is clouds. Can climate models effectively forecast cloudiness? Short answer – no. Clouds are one of the Achilles Heels of climate models. So next time you hear about a climate model forecasting an ice free Arctic, ask if they have the cloud problem under control. It is cloudy at Santa’s Workshop right now. top class! An awsome post. Simple, obvious (once seen), damn near irrefutable and a fine question at the end. This planets climate will never be understood until ALL factors are taken into account. No one storm or weather anaomaly is the same due to the planetary changes constantly in effect that will change the outcomes. The slowing of the planet, distance from the sun, planetary gas changes in pressure, gravitational changes, etc. Planetary mechanics has an effect with rotation, timeframes and reflection of solar energy, angles of solar penetration, atmospheric distruptions(moon), etc. Just look at those +15ºC for the internal temperature! Do they have a current air temp at this location? Speaking of clouds just shift all the clouds 1000 miles equatorward or poleward in both hemispheres via more negative or positive Arctic and Antarctic Oscillations in the air and there will be found all the albedo change you need to significantly alter shortwave input to the oceans, especially in the southern hemisphere. The change in angle of incidence onto the clouds will make all the difference and most likely will make a much bigger difference than that involved in Svensmark’s ideas or the issue of polar ice quantities. Anything man-made needs to be painted bright white to avoid increased AGW. That’s the only way. Lol, Steve Goddard, there are 32 Sunspots according to the World Climate Widget! Arctic temperature during the last 150 years or so appear to be closely correlated to the average geomagnetic field (GMF) in the area. Haha, clearly we live in interesting times. Excellent article! According to mine today (Jun 16 2010) it is Null. That’s the “sunspot number,” not the “number of sunspots.” And the solar flux is only 72, which is barely above minimum. Simply put, and beautifully argued: the way science should be reported. The sun is spotless today. Good timing. A natural process of planetary cooling is distance from the sun. Solar rays concentration disperses more as the further away from the sun you get. Due to the sun’s rotation, there is no gaps in the solar dispersment that we feel BUT it is less concentrated with energy. Example: 10 molecules of energy hit you right now. Move away and 8 molecules, move further and 6 molecules, etc. NOW, add our planetary rotation. I’m telling ya Steve, rotation is the most understudied area with the most importance to understanding the mechanics of climate. I’ve got a nice big white SUV, am I helping? I don’t see much of an air pressure change to cause any weather fronts to generate the 2 hour increase in temperature above the trend of the rest of the days values???? Interesting how, at least visually, the Greenland icecap is much more reflective than the sea-ice, etc. Perhaps its higher elevation lifts the reflecting surface above much of the obscuring atmosphere. I am sure this will upset the “Don’t confuse me with the facts, my mind is made up” crowd who have become increasingly vocal about Steve’s posts on the Arctic ice. I read claims that the Arctic is warm yet the DMI plot on the border shows the Arctic temperature above 80 N is right on the 52 year average line and just at the freezing point. Could someone explain the difference to someone who has not spent his career studying the Arctic temperature. Would the insulating effect of the clouds have an effect positive or negative on the surface temp? Misleading, off topic, and guaranteed to take the comments off in the wrong direction. An off-the-cuff phrase like that can prevent your readers from remembering the point of the article. Maybe the sun came out for a while at 1100? Kinda funny that isn’t it Vuk? Keep telling ‘em, maybe some of them will wake up. While clouds and Sunlight are factors in ice melt at the Arctic, the water currents and water temperature are the main factors. The water temperature depends on Sun and clouds also, so there is an indirect relation there. However, currents are controlled from greater distances, and by other events than direct Sun or clouds at the Arctic. Your analysis is too simplistic. Are you suggesting that the sun didn’t used to have sunspots? I do want to point out that your analysis is valid for land based ice, so Greenland and other locations near the Arctic are mainly affected by the Sun with major modification by clouds. What is the source of the relative cloudiness over the arctic during melt season of 2009 vs 2007 vs 2010? You just can’t stop propagandizing can you Steve? An accurate post would say “Before Obama’s………..”, but you can’t resist twisting the facts. I am not sure how accurate that animation is supposed to be, but it clearly aint very accurate as it shows all of northern scandinavia to be in dark, when in fact they have been experiencing 24/7 sunlight for quite some time already. I don’t know if you or anyone else here have any figures of the amount of melting that can be caused when snow/ice is contaminated by varying degrees of soot? I am inclined to think that whilst there are many factors involved in ice melt-of which the sun, clouds, surface and sea temperatures, wind, storms etc are all highly relevant-that soot is also significant. The latter can be solved to the advantage of everyone by better emissions controls on dirty industry-primarily in China and India. Well. I’ll match your big white SUV and raise you with my big white van as well. And my motor home is white too. So I’m practically saving the planet on my own. Ric, relax. I think Steve’s sunspot comment was made in good fun. Don’t forget sublimation. It can be significant at ‘low’ temperatures and ‘bright’ sunshine. No, actually it seems to be just a hint of humor to perhaps brighten the reader’s day and make the article a little bit more layman-friendly. The point is made loud and clear. The Antarctic Ice seems to be doing very well as usual, driving the global sea ice mean slightly above normal. It would be interesting to see a comparison of cloud cover and Antarctic melt seasons. Please, only those who don’t want to face the facts would seriously go in the wrong direction. “Please take me in some other direction with amusing tangents, my mind is discombobulated by the facts.” No one goes off track because of a little humor. tallbloke (6:20 am) and vukcevic (4:23 am): I agree. Keep telling ‘em. In the arctic, clouds consist of ice crystals (snow flakes) that tend to align horizontally. Most UV from a low sun angle will be reflected back to space when it strikes these crystals. Also, the processes in the formation of these clouds control the rate of OLR from their tops and CO2 has little to do with them. http://www.kidswincom.net/CO2OLR.pdf. I still don’t see surface albedo having much of an effect on global temperature. The climate clearly isn’t very sensitive to it, as we saw this last winter in the NH. Most of the NH was covered with snow and ice, yet there was no dramatic climate shift, no tipping point into an ice age, just business as usual. Many parts of AGW are filled with guesswork and the word “uncertainties” [pdf] and clouds, even they admit, are quite a problem, yet they are 90%+ certain about the dominant human ‘signal’ during the end of the last decades of the 20th century. As if we needed any more proof that American Liberty reality trumps latte’ commie fantasy? Amazing! I also tend to see wind (driven by jet stream and AO conditions) and current (driven by oceanic oscillations related to ENSO) as strong drivers of ice behavior, with clouds acting as a somewhat less effective feedback variable. …with solar as an external constant acted upon by Earth bound internal atmospheric (IE clouds) variations. Vuk: How does this relate with the solar activity/solar wind? I say it is the sea temperature, which affects the ice melt/freeze the most. If you graph AMO (=detrended NH Atlantic SST anomalies) and arctic ice anomaly against each other, you get excellent correlation. Wind of clouds are just a cherry on top. This brings me back to my earlier thoughts on a previous post. I’ve noticed that open water reflects sunlight pretty well. You can pick up quite a sunburn out on the water in just a short period of time. I’ve seen video taken from space that shows the sunlight reflecting off the ocean like a giant mirror. Narkissos saw his reflection in the water, which was acting as a mirror. If the angle of the sun to the Arctic is only 23.5 degrees, then I would think that open water at the Arctic would reflect quite a bit of the light rather than allowing the ocean to absorb it. Add those clouds into the mix and whether or not Santa’s Workshop is ice covered or floating isn’t going to make much of a difference, except to the reindeer. The point being that open water in the Arctic might be created by Global Warming, but it might not contribute to additional warming because open water at that lattitude would reflect much of the sunlight that isn’t already absorbed by the additional atmosphere that it has to travel through at such low angles to the surface. Am I smoking medicinal herbs here? And clouds are likely in a “symbiotic” relationship with cosmic ray flux. The Chilling Stars. Tom, please see work by Don Perovich at CRREL who has spent a large part of his life measuring snow/ice/water albedo, I think his work will answer much of your question. He also has some recent papers that show how much the ocean has been absorbing in recent years and how much that has contributed to additional ice melt. Additionally it’s important to understand that sea ice covers not just the north pole, so the sun is higher in the sky than 23.5 degrees during summer over large parts of the Arctic Ocean that are currently covered by sea ice. Just looking over at spaceweather.com and they have the most beautiful pics of noctilucent clouds. They tend to be greatest just after a solar minimum. Since the min was long this time around, would an increase in these clouds have an effect on the SW entering in? > Are you suggesting that the sun didn’t used to have sunspots? No, I’m just trying to get you to write more clearly, unambiguously, and write more for the new/occasional readers here rather than those of us who know how the SC24 sunspot history correlates with other cycles. However, it doesn’t seem to bother others here, so I’ll try to not let it bother me. Thanks Julienne, I shall take a gander. Yes you are correct the sun might have, and probably did make an appearance to cause the rise in temps for those two reports. I did not think of that. The numbers just stick out and I was thinking this might be another case, like the METAR errors, of minus signs being left out. The temp values for the two or three days before and after these readings for the most part are all below zero. These words are to be saved. And if added to them what causes that shift…you got the whole picture. I must be confused about the lack of sunspots. NASA says otherwise, and I was warned yesterday how important it is to trust the judgement of experts. There will come a day when fearlessly post-normal science beliefs will be bravely contested, then a new era will open up to the human kind. It won’t matter if the “holy church” trembles with anger or if their inquisitorial priests cry aloud, their time would have been gone forever. Limited data have hampered attempts to identify which culprits are to blame, but new satellite-derived information provides insight into the drivers of change.A clear message emerges.The location of the summer ice edge is strongly correlated to variability in longwave (infrared) energy emitted by the atmosphere (downward longwave flux; DLF), particularly during the most recent decade when losses have been most rapid. Increasing DLF, in turn, appears to be driven by more clouds and water vapor in spring over the Arctic. So what Francis and Hunter are saying is that the ice edge depends in large part on the DLF, which is controlled by clouds, but their results showed that an increase in springtime cloudiness (defined as 90 days from the ice extent maximum) led to a decrease in the ice edge. Basically, clouds have either a warming or cooling affect depending on the time of year they are present and also if they are over a bright or dark surface. Over a dark surface they tend to have a cooling affect whereas over a bright surface they tend to have a warming affect. You can look at cloud forcing by separating out the shortwave and longwave components such that the total cloud forcing (CF) equals the shortwave cloud forcing (CF_SW) plus the longwave cloud forcing (CF_LW). These can be defined as the difference between say clear and cloudy skies such that CF_SW = Q(Cf) – Q(0) , where Q is the net surface SW flux and Cf is the cloud fraction. Same thing for the CF_LW. The shortwave component (CF_SW) becomes more negative as the albedo decreases and at higher sun elevations, whereas the CF_LW is positive. So the question becomes does this negative cloud forcing from the shortwave component outweigh that of the longwave component? During springtime the answer is no, the longwave component dominates and clouds have a warming affect (see more work by Francis and others). Data from the 1-year SHEBA project actually showed that only during a brief period in summer did the shortwave cooling affect dominate. Note that the aerosol terms will have added uncertainties due to the uncertain semi-direct and cloud lifetime effects. These uncertainties in the response to the RF (efficacy) are discussed in Section 2.8.5. It certainly makes sense that LW would be greater than SW during the early spring, because there is very little SW in the Arctic at that time. And all of us here in Colorado are familiar with the idea that cloudy winter nights feel much warmer than clear ones. 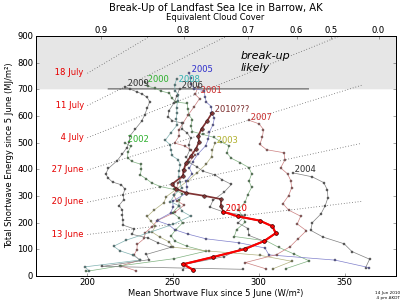 The University of Alaska believes that the summer breakup of ice at Barrow is defined by the amount of SW received. Well they say one picture is worth 1000 words; and your polar picture sure fits the model. Unfortunately, Steve, your one picture also conjures up 1000 questions. Question #1 would be; Is this Photograph (satellite) Photoshopped; or is it REALLY RAW ALA MOTHER GAIA DATA ? Are you able to find out Steve from your sources; what if any processing has been done to the picture ? Why do I ask ? Well that Greenland snow white is exceptional. As you point out, the sun angle is only about 23.5 above the horizon (if I understood you correctly); but the satellite is a near zenith shot; unless it also has been geometrically transmogrified as well, as photometrically. Assuming source honesty; we are looking at extremely wide angle scattering for that Greenland snow image. It would be really great Steve if you have some way to get a hold of pixel numbers for this picture; so you could extract some relative “brightness” numbers for the Greenland snow, and some nearby muddy sea ice (and clouds too). I’m guessing that we are looking at a lot of either very fresh snow; or at least very stable unmelted snow; and If I were a betting man, I would venture that that snow is more than Lambertian scattered (cosine theta) and much closer to isotropic at 66.5 deg scatter angle; which would be characteristic of a thoroughly rough surface; whereas a frozen sea ice surface is likely to be more “optical”, so limited to closer to Lambertian scattering. Question #2 would be:- “How’bout dem clouds !” So much for the polar regions being dry deserts; well at least that north polar region. I have always believed that there is no place on earth where atmospheric CO2 ever exceeds atmospheric H2O; well at least up to the Tropopause. One might almost say that we would be making a good trade, if we traded off ALL of that north polar sea ice, in exchange for clouds, and the resultant land snow that results from those clouds. And remember; there’s more land in the arctic (>60 N) than there is in the Antarctic (<60 S); so plenty of substrate to snow on. So bring on that ice melt; we need it to cool the planet. By the way Steve; those were serious questions. It would be great if you can put some brightness numbers to some of those characteristic regions in that picture (or some similar one) I wonder if Svend Hendriksen in Greenland; has some similar pictures; he might even have some brightness data. I have on my office wall that wonderful picture of the "ice free" British Isles bemoaning their loss of snow. I’d like a dollar for every time I have heard; since inauguration day, that the President’s polling numbers have dropped precipitously (after this or that event). Funny thing is every one of those polling reports have said the same thing; his numbers have dropped to 42%. I don’t know how the polls can keep on reporting these drops if they never go below 42%. Well to me the only polling number that counts; is the one in Nov 2008 that put this candidate in office. And since it is not my privilege to participate in that choice; i’ll say nothing on the result; or for that matter the recent polls; whoever does them. He’s MY President; for at least as long as American Citizens are happy with their choice; and wish to retain his services. The arctic temperature above 80N is never going to go above about +2C until all the ice is gone. The melting ice holds the temperature near zero (yes – an experiment you can do at home). Take a look at any of the years in the archive; the summer temp is always in the +1 to +2C range. This will not change until a significant proportion of the ice at those latitudes is gone (/sarc ie 2013 or so /sarc). Steve, I do think it’s important to state that the Barrow study is looking at landfast ice, which you an see in the MODIS images still remains attached to shore, whereas the ice around it has retreated. Landfast ice contributes very little to the total sea ice area. Thanks for posting the link to the Barrow study though, I hadn’t seen their web page and it’s very informative. And yes you are correct that clouds are important and climate models currently have a lot of uncertainties when it comes to modeling and forecasting cloudiness. I’ve been told that floating ice melts from the bottum up. Not from the top down. Heat capacity of water >> heat capacity of air. D’oh! Arctic Ocean circulation is the dominant mode of Arctic ice melt during the melt season. Mass transport of warmer waters into the Arctic Ocean from lower latitudes. D’oh! So there goes your albedo and air temperature arguments, right out the window, as it were. maybe someone from NASA could help out. Over the millenia, how much of this soot is due to large forest/grass fires? Good point-it’s a measure that must wax and wane over the years and may certainly have had an effect on past meltings. Other natural activity must also play a part. Human caused soot deposition must also be a significant factor though, and whatever your personal beliefs in the magical properties of CO2, combating soot by better emission controls is surely a win win situation. That would be like asking to the Church, in Galileo times, why does the earth orbit the sun. You have to become an open apostate of the Post-Normal Church, to know it. Do you believe that the open water west of Barrow is due to melt, or due to wind transport of the ice out of the region? Mostly perhaps but the existence of melt ponds indicates that it also melts from above. Of course the black is the open water. Why is everyone leaving out the submersed active volanic range at the bottom of the Arctic Ocean? Or is hot water from this no longer a factor? “End of the world: Will 2013 space storm kill us all off? Solar flares could cause power grids to overheat, causing our electricity dependent lives to go into meltdown, according to Nasa. A ‘once-in-a-generation’ space storm is forecast to stretch from late 2012 into 2013 when the Sun’s 22- year magnetic energy cycle coincides with its 11-year peak in superpowered sun spot activity. ‘We know it’s coming but we don’t know how bad it’s going to be,’ said Dr Richard Fisher, head of Nasa’s Heliophysics division…. And it was not scaremongering, he said, … – with power cuts in the city and broadcasting disruption as satellites were knocked out of action. I just wonder how they are going to blame this “huge space storm” on CO2 or how they are going to spin it so “more taxes, less freedom” are needed to save us all. The paranoia level is increasing around here. 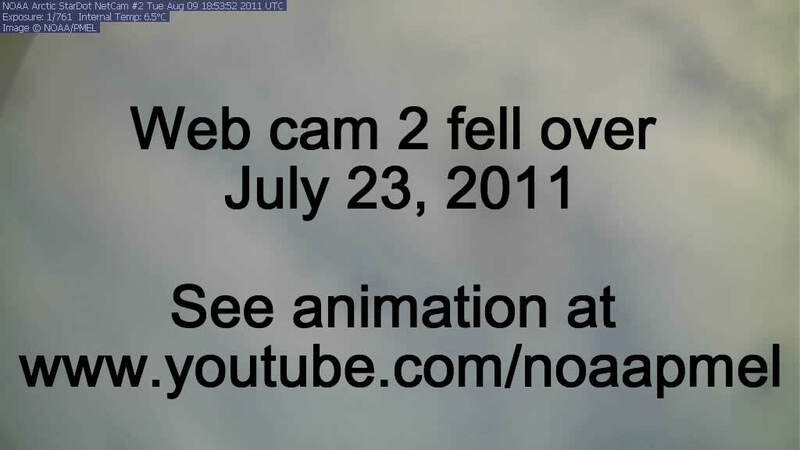 Of course the image is not Photoshopped, and it is very easy to tell the difference between clouds and ice. Please find something intelligent to argue about, if you must. It will be interesting to see if the Dipole pattern persists through summer. We believe that pattern was largely responsible for the 2007 minimum (especially given the thinning of the ice in the years leading up to 2007). That is really interesting; slowly I am jamming my “favorites” folder with snippets of links you have fed me. False color imagery is a Godsend. I use a lot of false color representations when I am doing lens designs. Not immediately quantitative necessarily; but amazingly quick to grasp what’s what. Sometimes I wish my beach sand stick could do false color drawings too. Thanks again for that high res. Amazing how black the sea really is. Which is one reason why I don’t feel too uncomforable doing back of envelope BB radiation calculations; knowing that 70+ % of the surface ain’t too far off reality. Steve, no offense…but it’s not very easy to distinguish clouds from snow/ice in the visible 😉 Yes our eyes can see it, but trying to develop an algorithm to discriminate clouds/snow/ice using visible imagery is very difficult. Luckily MODIS carries a band at 1.6 microns that helps (though it still has problems). 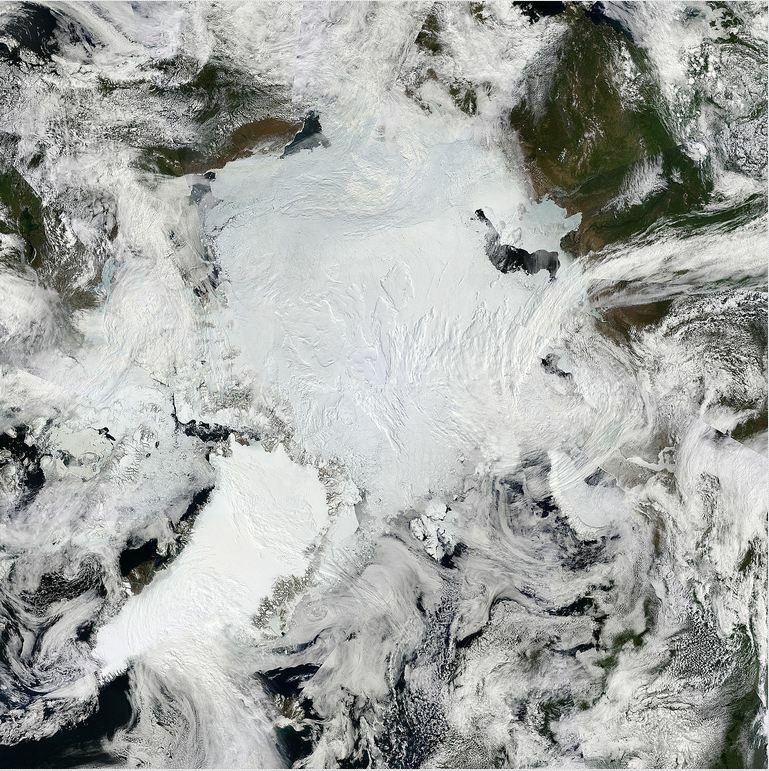 Also, the Arctic MODIS composites are just that, composites obtained at different times of the day. I do not believe these images have been corrected for the dependence of the reflectance on the solar zenith angle (you can see that when you zoom in on a section of the composite that contains data from two different swaths since the reflectance changes). So this composite image will contain differences in “brightness” that are not always a result of a change in surface type, but also a change in time of acquisition. I would expect reflectance over the high elevations of Greenland and at the Pole to be the brightest though, since those regions are clearly not experiencing any melt at the moment and you can see that in the image you linked to. I love visible imagery, too bad the Arctic is cloudy so much of the time. 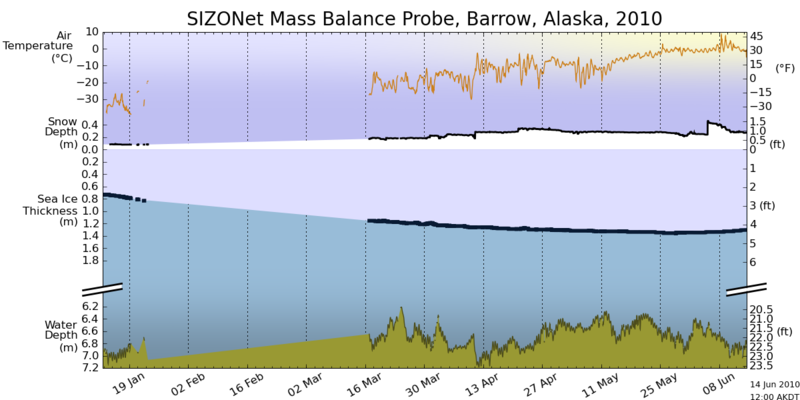 The U of Alaska monitor shows no evidence of melt from below prior to a few days ago. The area of open water west of Barrow opened up very quickly several weeks ago, most likely due to wind. Well Steve; assuming your comment was meant for me; I thought it would be obvious that “photoshopped” was simply a figure of speech; merely questioning whether the picture was a raw out of the camera photo or whether NASA or whoever took it had to do any data reduction to arrive at the picture you posted. There was never any intent to imply that YOU had messed with it; never crossed my mind; I was merely asking if it was afe to assume that it was about human eye equivalent. And no argument was intended; I simply wondered if it was possible to find actual real photometric (or radiometric) “emittance” numbers to put the whiteness contrast on a quantitative basis. If you got the impression, I was questioning your veracity; then I apologise; there was never any such intent. And I believe I did say those were serious questions. Your higher res picture shows a bit more detail; but I was not unhappy with the original; just wanted to know that what my eyes perceived was real. That video is strange. Looks like earth stops rotating, but the ice keeps going. Steve, I agree that winds are playing a role for sure. Interestingly, the meridional winds have been stronger off the shores of Siberia than Alaska and yet considerable ice remains attached to the shore (though the development of the polynya in that region is likely being forced by the winds). Air temperature anomalies from May 1 to June 13 have also been higher on the Siberian side. So it may also be that the ice off the coast of Alaska was thinner than off the coast of Siberia and that SSTs are also warmer in that region. I suppose a look at buoy temperatures would help shed some light on the contribution of the ocean to melt in that region. You also have high pressure in the Beaufort Sea (well-developed Beaufort Sea High), and since the skies tend to be clearer under high pressures, solar input is likely also playing a role. Certainly when you look at high-res MODIS imagery from the Beaufort Sea you can see surface melt occurring and it does “appear” to be more advanced than on the Siberian side (just by looking at the MODIS data). I like the animation though, we might have to consider putting one together for one of our news stories. It does nicely show the development of the open water areas. If you want some assistance generating animations, I’d be glad to help out. thanks for the offer of help Steve. I’m the one who brought up Piomas, Predicts DOOM THIS YEAR, etc. As my DIRE FEARS are from the current El Nino mimicing 2007 but MORE SO. And as 2007 did 3 things, 2 of which are worse this year. — You made my day, week & Year so far. Not do you give a source adressing this but 2010 is NOT as bad as 2007 — in Cloudiness. I really prefer not to die. This is a Good site & good news ! I’m with you. I would say that something that affects 90% of floating ice will have a much larger effect than something that can only affect the top 10%. Antarctica’s ice is mostly up in the air, on land, and it’s doing fine. It’s only having problems with floating ice too. Do you really mean to claim that there’s more land in the Arctic than in the Antarctic? Latitude, just to be clear, sea ice is the ice that forms from freezing ocean water. It is not the same as an iceberg, which comes from land. Sea ice that forms during one winter is usually about 1.5 to 2 meters thick, older ice can run 5m thick. When you are in the Arctic you can see heavily deformed/ridged sea ice that sticks out a few meters above the surface of the ocean. But that should not be confused with icebergs, which have most of their mass below the water surface. Didn’t know ‘iceberg’ carried that specific definition. Thanks. But ice is ice, Latitude is right on 89-90% under water, it always is, most of the mass is always under water no matter what kind of ice it is as long as it is floating. Julienne, does sea ice float differently than ice bergs? You ought to submit that for a movie, but, one seems to have already beat you. “Absolute Zero”. I’m ashamed to say I own. (Think my daughter bought it for me thinking “this is ‘science’ and ‘physics’ and my dad likes science and physics…”). If you’ve never seen it, don’t. OTOH, you might like it! Yea, WUWT is a very unique spot isn’t it? What Julienne is talking about is the difference between ice bergs and flat icesheets contact area with the water. Think of a rectangular iceberg 10x higher than it is wide, it has an area of 5 exposed to the air compared with 37 exposed to the water. In contrast an ice sheet 10kmx10kmx2mthick, the area exposed to the air is 100km^2 and the area exposed to the water is also 100km^2 (the amount exposed on the edges is too small to worry about). At this time of year the sheet ice breaks up into smaller and smaller floes so the edge contribution increases but the area ratio doesn’t change much until the floes get very small. The mass ratio doesn’t really matter it’s the shape that counts. Hi Steven- I’m pretty sure that these are water temps and not air temps. I have air temps at N 85° (-26.6°C) and N 87° (-25.8­°C) currently, but would love to have air temps at N 89°. Thanks. Then again, maybe they are not water temps. They might be inner instrument temp? Dr. Joel Norris of Scripps Institution discussed clouds & albedo at a colloquium at Fermilab, see video link above. Thanks Enneagram. I think I have set out the whole picture elsewhere. The position of the jets and the ITCZ depends on an interplay between variable rates of energy release from the oceans and an effect on the polar oscillations driven not by absolute solar power output but instead by levels of solar surface turbulence (operating via the solar wind) which in turn affect the energy flux from tropopause to space. The dark red color means the surface is actually not frozen – there is liquid water on top of the ice. Green indicates no ice at all and the ocean is black. However, this year the ice is also disintegrating and no longer qualifies as an ice shield. Looking into my cocktail it reminds me of crashed ice. I have tried to take the ice capades seriously. But I can’t. There is too much confusion. It’s as if everyone was trying to gauge the climate by looking out his (satellite) window and each seeing a different metric was reaching his own conclusion. Who declared the Arctic the be all and end all anyway? Al Gore? Enuff said. Let it go. If we left the Arctic to itself for 10 years and then came back to it it would still be its own little ecosystem troubled by wind, currents, ice, and (as we see everywhere) inhabitants who see an economic opportunity in exaggerating every little whiff of warmth, real or imaginary. Instead we are hovering over it hour by hour as if tomorrow’s report meant everything. It’s all sound and fury signifying nothing. I understand the knee jerk response to Gorian insults to intelligence. We feel we must respond to the insanity of his Truths. But you cannot descend to that level of foolishness without becoming equally tainted by it. Hour to hour, day to day, week to week, season to season and year to year variations in weather or ice don’t mean anything. Full stop. Come back in 50 or 100 years and see what has happened and maybe, just maybe, it will be meaningful. But probably not. A thousand years might give you a reliable trend. Emphasis on might. When it comes to Arctic ice we are all climate babies, flailing around and by what we touch, trying to describe an elephant even before our eyes are open and we’ve learned to talk. Exactly right. The reason for the incessant arm-waving over the entirely normal and natural fluctuations in Polar ice cover is because that’s all the alarmist contingent has left. One by one, each of their worries has been debunked in turn: fast rising sea levels, methane, ozone, drowning polar bears, disappearing coral, disappearing Himalayan glaciers, frog extinctions, etc., etc. Now it’s Arctic ice cover — as they studiously ignore the fact that global ice cover is now above average, and the Antarctic is gaining ice. They’ve been wrong about everything else, so now they’re desperately flogging the Arctic ice scare. It’s all they’ve got. Ok, I just wasn’t clear on the fact that all ice needs to displace a certain of it’s percentage of water, in order to float, and that sea ice was different. Just seems to me that since sea ice has more surface area, thin sheet, it would also have more surface area exposed to the water and water temperatures. And would be even more affected by water temperatures than a more compact ice berg. “”” One might almost say that we would be making a good trade, if we traded off ALL of that north polar sea ice, in exchange for clouds, and the resultant land snow that results from those clouds. And remember; there’s more land in the arctic (>60 N) than there is in the Antarctic (60 N) than there is in the Antarctic (<60 S); so plenty of substrate to snow on. """ “”” One might almost say that we would be making a good trade, if we traded off ALL of that north polar sea ice, in exchange for clouds, and the resultant land snow that results from those clouds. And remember; there’s more land in the arctic (>60 N) than there is in the Antarctic (60 N) than there is in the Antarctic (60 N) than there is in the Antarctic (60 N) than there is in the Antarctic (+60 deg N.
So I guess I did say that. If you calculate the surface area of a sphere beyond +60 deg Latitude; and then calculate how far North of that you have to go to get just half of the area; you end up at +68.9 deg North Latitude. At the other end; only the tip of the Antarctic peninsula sticks North of the Antarctic circle; and about half the perimeter runs along that circle; but the Wedell Sea and the Ross sea go way south of that. Even so the Arctic ocean is smaller than the Antarctic continent. I’m sure you can Google up the actual land areas of Antarctica, and the area of the Arctic ocean and all the surrounding land areas; and I think you will find there is more land in the Arctic; thanthere is in the Antarctic; which seems to be just what I said above. The rising albedo trend dates back to the late 90’s when the jets started moving back equatorward again though I first noticed in 2000. As all those clouds move towards the equator their reflectivity increases, albedo rises, less solar shortwave enters the oceans. Having lived in Edmonton for nine very cold years in the 1970’s (-30c to -45c for weeks at a time) you get to know a lot about snow and cold weather. Sometimes I was playing outside in a t-shirt on a day that was sunny and around -20c! It would not get above zero for weeks. Yup, and the snow would be melting. Strange was what I thought. Maybe it was sunshine warming the snow? Never did get the answer to that one… so I’m asking if anyone knows. It could be related to the arctic ice issues. I found this comment and wonder if it’s correct? “CAN ICE MELT WHEN THE AIR TEMPERATURE IS SUB-FREEZING? I have made this observation on days in the winter in which there was snow cover: The air temperature was below freezing yet ice and snow was melting off house roofs, cars and other objects. Why would this occur? 1. Air is a very poor absorber of solar radiation while objects on the earth’s surface are much better at absorbing. Even snow with its very high albedo and reflective ability is more absorbing of solar radiation than the air. While a temperature sensor exposed to the air may detect temperatures below freezing, the sun’s radiation can warm individual objects above freezing (especially objects with a low albedo). The air temperature was below freezing yet ice and snow was melting off house roofs, cars and other objects. Why would this occur? 3. Houses and sometimes cars have internal heat. Even an unheated car in the sun can accumulate heat like an oven. It’s most noticeable in the summer, of course.